Shipping is used to ship articles and BOMs. The articles can be shipped one at a time or through collies, which again can be shipped in containers. Colli: Is used to register colli for shipment. - Name: Display name of the colli. - Dimension (m): Optional - dimensions of the colli: height, width and depth in meters. - Volume (m3): Optional - the volume of the colli in cubic meters. - Weight (kg): Optional - the weight of the colli in kilos including content. - Container: If the colli is to be shipped inside a container, the container must be selected. Container: Is used to register containers for shipments. - Name: Display name of the container. - No: The container number. - Dimension (m): Optional - dimensions of the container: height, width and depth in meters. - Volume (m3): Optional - the volume of the container in cubic meters. - Weight (kg): Optional - the weight of the container in kilos including content. Show All: Clicking the icon will show all shipping. Default is an shipping not shown in the grid if the column Shipping Date is earlier then today. Print Note: Immediately prints the current shipping Note. Preview Note: Opens a print preview window, described in its own document in the menu. Print Pick List: Immediately prints the current shipping Pick List. Preview Pick List: Opens a print preview window, described in its own document in the menu. Shipping From*: Shipment from where the shipment is taking place, order or project. The field is mandatory. Project No: If project is selected, a project number must be selected in a drop-down list. Order No: If order is selected, an order number must be selected in a drop-down list. Shipping No*: Mandatory shipping number. Is automatically suggested, if a shipping no sequence is defined in the Companies module, but can be overwritten. Creation Date*: Mandatory shipment date. Today is suggested by default, but can be overwritten. Shipping Terms Set: Optional shipping terms from a drop-down list defined in the module Shipping Terms. Delivery Address*: Delivery address should only be given if the delivery address differs from the customer address from the module Customers. Default is the address from the module Customer used on the reports. Delivery Date: Requested delivery date from the recipient. Shipping Date: Date of shipment from the company. Shipped By: The employee that has performed the shipment, selected from a list of employees registered in the Companies module. Top Text: Optional top text shown on the shipment report. Bottom Text: Optional bottom text shown on the shipment report. 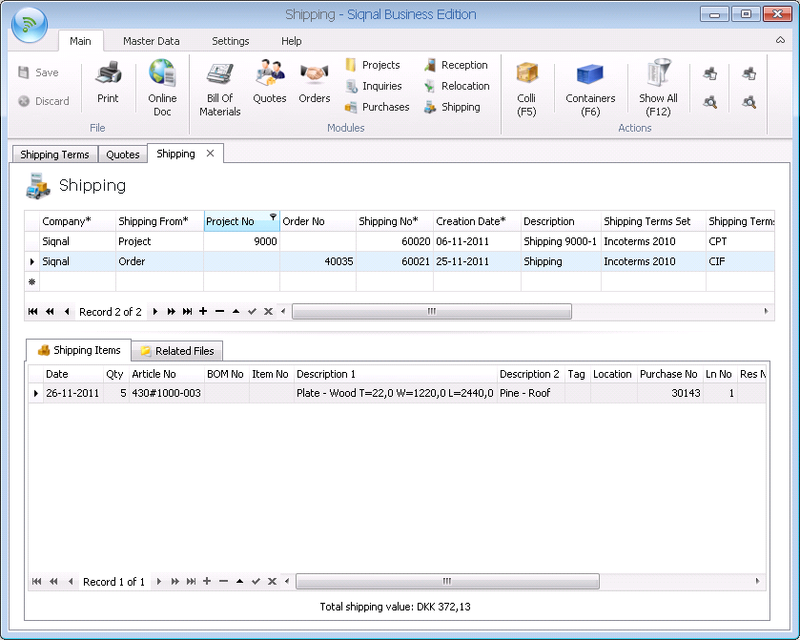 Shipping Items tab: Shows the articles or BOMs that the shipment contains. - Date: Date when the article or BOM was added to the shipment. - Qty: Quantity of the article or BOM. - Article No, BOM No, Item No, Description 1, Description 2, Tag, Location, Purchase No, Res No and Ln No: Read-only information. - Colli: Optionally a colli can be selected that has been created by using the Colli button. - Container: If the colli is defined as being inside a container in the Colli module, the container name is listed in the field. - Picked Date: Date the article(s) has been picked. Today is suggested, but can be overruled. - Picked By: Employee who has picked the article(s) for shipment. - Shipping Value: Shows the value of the line in company currency. Related Files tab: On this tab it is possible to register files that are related to the shipping. 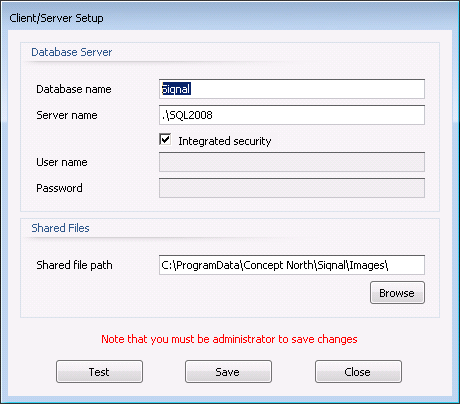 The files are saved into the system and are placed in the folder specified in the popup Client/Server Setup and with the Shared file path viewing below. Use append (+) bottom to add files. Up and Down are used to alter the order of files.